Conditional Formatting in Excel is used to change all formatting, background colors, border and shading, and many more as per given condition. In this article we know how you easily change each column background color using conditional formatting facility in excel. If Column A value is equal to Names then entire column should have a blue background.If Column B value is equal to Qty then entire column should have a light orange background.If Column C value is equal to Rate then entire column should have a yellow background.If Column D value is equal to Amount then entire column should have a gray background. 1. 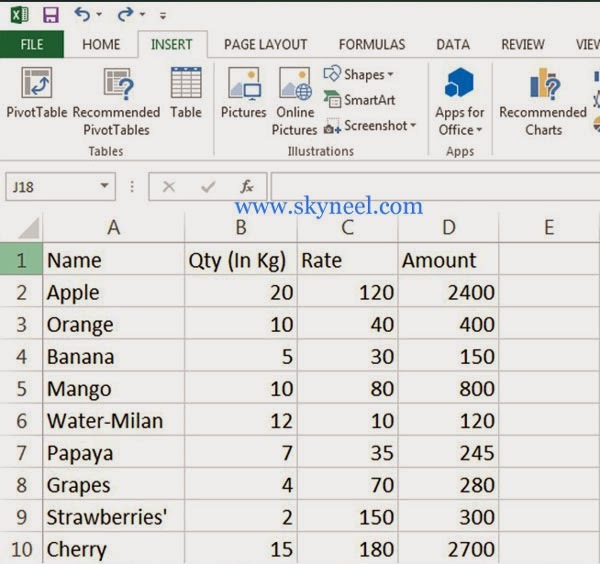 Prepare the following sheet only fill required data in each column. 2. 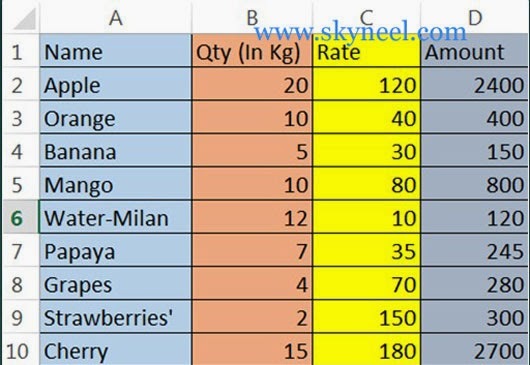 Select first column A by clicking column label A. 3. 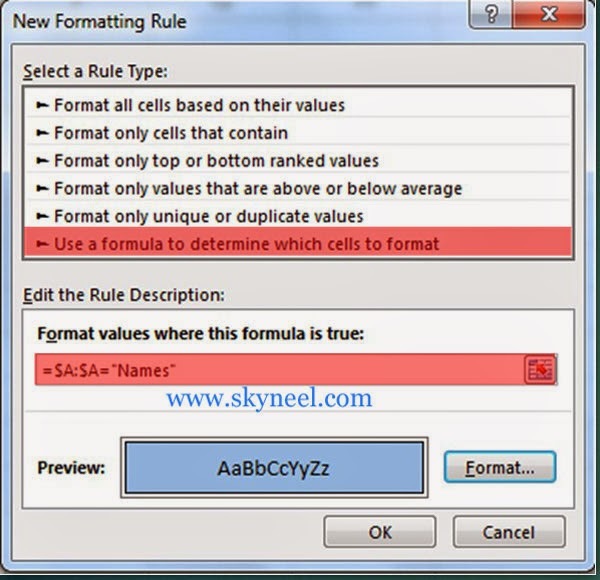 Click Home > Conditional Formatting > New Rule > Select a rule type > Use a formula to determine which cells to format > type following formula in given box =$A:$A=”Name” > Click Format button > Fill any required color from fill tab then click OK > Ok.
4. 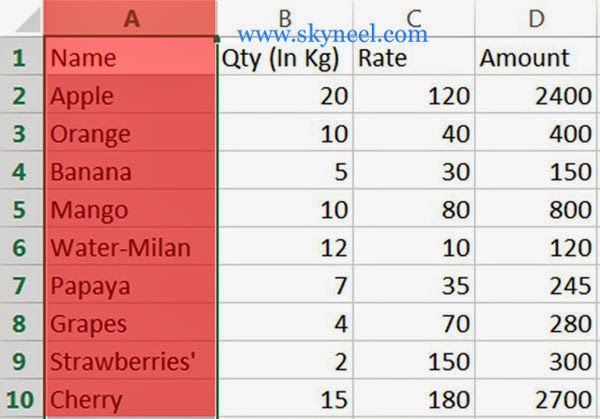 Select column B by clicking its column label then click Home > Conditional Formatting > New Rule > Select a rule type > Use a formula to determine which cells to format > type following formula in given box =$B:$B=”Qty (In Kg)” > Click Format button > Fill any required color from fill tab then click OK > OK.
5. 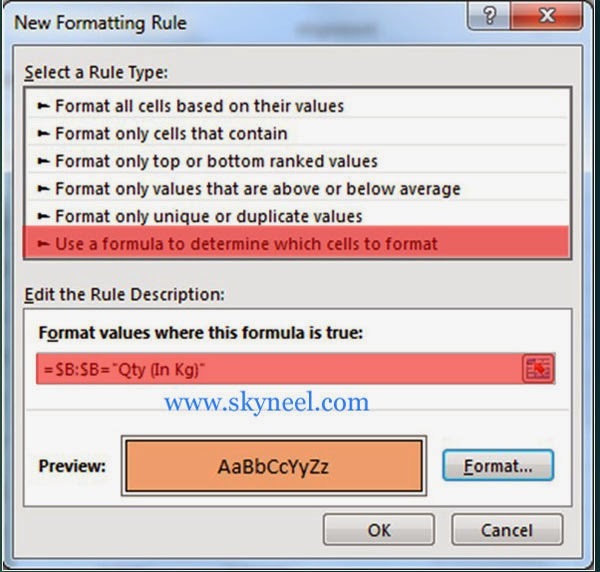 Select column C by clicking its column label then click Home > Conditional Formatting > New Rule > Select a rule type > Use a formula to determine which cells to format > type following formula in given box =$C:$C=”Rate” > Click Format button > Fill any required color from fill tab then click OK > OK.
6. 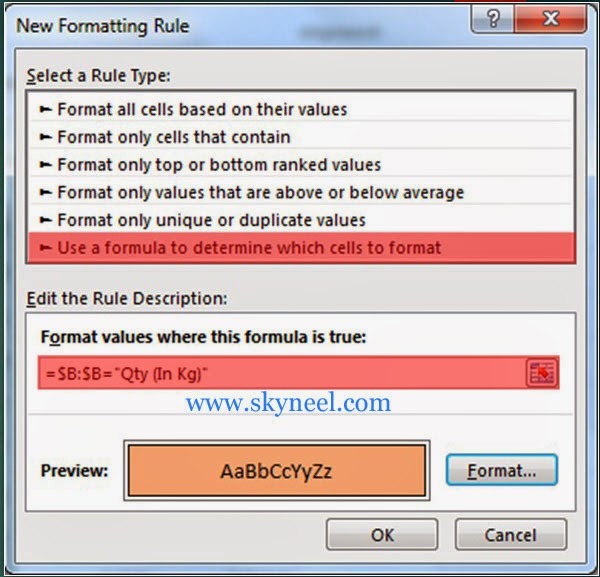 Select column D by clicking it’s column label then click Home > Conditional Formatting > New Rule > Select a rule type > Use a formula to determine which cells to format > type following formula in given box =$D:$D=”Amount” > Click Format button > Fill any required color from fill tab then click OK > OK. I hope you like this Conditional Formatting : Changing Column Background Color guide from which you will be able to easily Changing Column Background Color without any extra efforts. If feel any problem in this guide then please use comment box. Thanks to all.